Around three years ago, while moving house, graphic designer Adrian Sensicle discovered an unfamiliar box of negatives. After scanning them, he realised the images were 30-years-old and from a fondly remembered time in his youth. 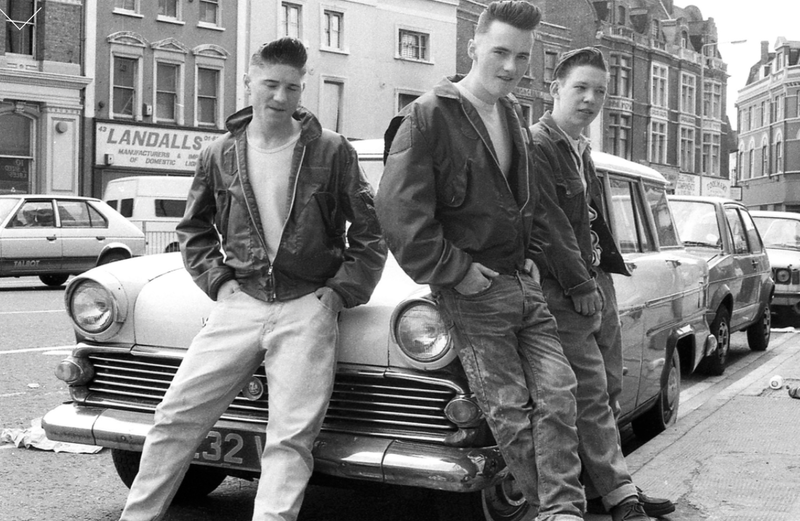 “There were hundreds of rockin’ photographs that were taken in London from 1983-1985,” says Sensicle. “I was a graphic design student in Coventry then and had been coming back to London in the summer to go out to all the rockin’ clubs … At the time, the energy of punk had all gone and everything had started to get a bit slick and corporate. MTV was sort of just starting then, so the rockin’ thing was a certain reaction to that. Sensicle decided to set up a Facebook group (Rockin’ London in the 1980s) and started posting the images. After a while, a lot of people from the scene discovered the group and began recognising themselves and old friends in the photographs. As the group gained popularity, Sensicle received suggestions to create a book. But while he had the images, he realised he needed a story to bind it together. So he got in touch with an old friend from the scene, David Waterman. The book is currently looking for donations on Kickstarter. Before the campaign ends next week, we caught up with Dave Waterman to hear about his experiences as a youth, growing up with London’s 1980s rockin’ scene. Could you speak about how it all started for you? When I was a boy, my mum used to like Elvis. So I got into Elvis when I was in primary school. At the time, it seemed to be that you were either a ted or a punk – at least where I came from. Even though I was only nine or 10, I used to like rock’n’roll and regard myself as a bit of a ted. I started wearing the clothes and styled my hair into a quiff. It was like that when I went to secondary school. I became more involved in the whole scene but I was a rockabilly then. I was at a south London school and the only rockabilly out of 1,500 kids. I went to school 15 miles away from where I lived because my mum thought the schools round there were rubbish. So she found this school for me in Lambeth. It had a French-sounding name – Beaufoy School. Because it was 15 miles away from where we lived, she never heard the horror stories. She thought, it’s got a French name, it sounds posh, I’m going to send him there. There was an article in The Sun in the 1980s saying it was the worst school in Britain at one time. You had to have an absolute dedication to the music to be surrounded by 1,500 kids who wanted to beat you up because you looked different. You had a hard time then? For the first few months, it was absolute purgatory. Fighting every day with these pretty violent kids – ted this and ted that. Eventually, because there weren’t anything anyone could do to me at school – or try to do to me – that was going to make me walk away from what I was and the music I was listening to, I became accepted. As the years went by, I just got more and more involved in the music, rather than the scene. Because, being young, I weren’t going out to clubs or pubs. I used to go to specialist record shops and buy my music – that was all I’d listen to. How did you move into the scene from there? At about 16, I was aware of pubs around south London where they’d have rockin’ nights on. So I started to go into them. Then I slowly became involved in the south London rockin’ scene. I had left home when I was 15 and moved in with my girlfriend. We had a child when we were 16. So, I had my own flat in Peckham with my girlfriend and child. After getting involved in the pubs, I started going to a club called the Phoenix at Cavendish Square, Oxford Circus – where a lot of Adrian’s photographs are taken. It was a particular group of people that you’d see at the different clubs. Everyone was really immersed in it. None of us listened to anything other than rock’n’roll, rockabilly. Some went even further back, listening to the hillbilly bop and blues. Everyone dressed in authentic American 1950s clothing, rather than the British teds who’d wear drapes and crepe-soled shoes. I met Juliet, whose Adrian’s sister, when I was 15. She went to school just down the road from me; we were sort of girlfriend and boyfriend for a while. When that finished we became friends and I got to know Adrian. Juliet started coming to the clubs with me, and Adrian came along as well – taking his photographs. Rather than being a rockabilly himself, he enjoyed the music and liked the camaraderie of it all. Was the scene the most important thing in your life at that time? For me at the time, I wasn’t working. And to be quite honest, I didn’t care that I weren’t working. Rockabilly was it for me. I’d get up in the morning, put my records on, listen to them and just do what I was doing. We’d go to the Phoenix on a Friday night, Dingwalls on a Saturday afternoon, Silks nightclub on Saturday, Downham Tavern Sunday night. That was my life then from about 1982-1987. That’s a period of five years when I was really immersed in the rockin’ scene. My friends were all rockin’ and that was it. The people that I’m telling you about rejected modernity. They were so immersed in the 1950s that if you went into their house they’d have it all. I knew people who would put their television into a cupboard because it was modern – and just get it out when they wanted to watch it. For me, I wasn’t working. I had my girlfriend and daughter, so didn’t have a lot of money. I used to get the bus to these clubs and turn up with enough to get in and minesweep beers all night. The people that did work would buy 1950s cars. That was me then for pretty much five years. Those were the only clothes I had as well and I wore them all the time. It wasn’t like; I’m going to dress up on a Friday night and go out to the Phoenix. I didn’t have to dress up; I went out in the clothes I was walking around all day in. Why did you move away from the scene? Around 1987, I had a bit of a wake-up call when I went to the unemployment office for a meeting. They sat me down and said, now that you’re long-term unemployed we need to start thinking about getting you back into work. What was said to me then came as a bit of a shock. I was so involved in the rockin’ scene that work wasn’t something I was bothered about. I did alright at school, so when he said to me, you’re long-term unemployed, I thought, bloody hell how did that happen? I need to do something and one of the things that’s not helping me is being involved in this rockin’ scene. I didn’t turn my back on the rockin’ scene, what I did was went and joined the army. The army pulled me away from it in 1987. I was away for five years. Mainly in west Germany. I was in the armoured regiment – lived there and went to different places around the world. I used to come home on leave and occasionally see some of my very close friends from back in the rockin’ scene. The scene had developed a little bit then. They started to play different types of music and stuff that we wouldn’t listen to back in the mid-1980s. It was a bit alien to me. I went to a couple of rockin’ clubs and saw the same people doing the same thing. I’d left it, I walked away from it. I’d joined the army in order to develop myself. And I had done, and could easily see myself slipping back into how I was then. I had a friend who lived with me for a couple of years called Chang – who is pictured in some of those photographs. He didn’t work either and was fully immersed. When I came out of the army, he still wasn’t working. I thought, I’ve made a positive transition here to be a productive member of society. What I probably don’t need is to get drawn back into it all and throw it all away. How did you reconnect with the scene when the idea for the book came about? With the advent of social networks, there are quite a lot of active groups on Facebook from people who were around then. Adrian’s photographs, when he put them on Facebook, actually brought a lot more of these people back into contact with one another. On the Rockin’ London in the 1980s group that he’s created on Facebook, there’s a lot of people on there that I used to know and have re-acquainted with now through that. The London rockin’ scene still exists now but I’ve heard that it’s not as healthy as it was back then for various reasons. You can see a lot of the people that I used to know back in the 1980s, when we were in our teens and early 20s, who are now approaching 50 or over. They dress exactly as they did then. They look exactly as they did then, although with 30 odd years of age, grey hair – or no hair – and a few pounds round the middle. The way you’re describing it now, it sounds like it’s become a thing of the past. Was it a good feeling returning to these memories? Yeah it definitely was. It brings back memories. I look at it now and think back on it with affection. For me, it is in the past; it’s a person that I was then and not now. I look at the photographs every week. Some of those people in those photographs have passed on, some have become really successful. Some are just, as I said, still unemployed and doing the same thing that they were then. It seems that for each person, the best years they have in a scene last about five years. Did you feel that identity became less of an importance to you as you got older? It was everything in the 1980s. It was everything when I was in my teens. It defined me – that was it and nothing else. Then I joined the army and I suppose by definition I became someone else. I became a soldier. In many ways, that was what defined me then. It was almost moving from one sort of tribe to another. It became about my close comrades who I served time with. But I still listened to the music then however. I had a lot of my records that I took with me to Germany but I’d become someone else you know. I’d grown out of it. For a lot of them, they’d probably regard that as being an unpleasant thing to say because it still meant everything to them. But I just developed and my interests had widened. What was so important to the people in that scene? I think the driving force behind it was the music – a love of the music. It was a developing musical scene at the time. There was all the stuff that was released in the 1950s that made the charts here. So Bill Hailey and the Comets, Elvis Presley, Little Richard, Chuck Berry – all that stuff was in existence. People listened to it and it was great music. But, being discovered at that time was a lot of unreleased music in America – rockabilly stuff. When it was recorded in the 1950s, it was considered as being not polished enough and not good enough to release into mainstream charts. A few decades later and it was being released in the UK. For the first time, we were discovering music that had never been heard here before. It wasn’t an antiquity at the time. It was brand new and just been released here. Quite often, the first place you’d hear this music was at clubs. You’d go, wow it’s really great. And go buy it yourself. In answer to your question, it was because of that – because of an adherence to the music. The whole 1950s look, the way I saw it, was secondary. It was the way that you dressed at the time because of the music. The music was the driving force and most important part of the scene. Why do you think people chose it over other scenes in the 1980s? One thing Adrian mentioned was that it was about harking back to simpler times. I don’t think many of the people involved in the scene actually considered that. I think in the 1980s, things were pretty simple anyway. There was a lot less of the sort of stuff that we have about today that complicates our lives. I don’t think they necessarily needed to hark back to anything. It was quite simple then. It was just an absolute love of that music. I’m sure others felt it as well. When you walked into one of the nightclubs and you could hear the low hum of the music, it was electrifying. It was absolutely brilliant. No other music made me feel like that. Nothing made me feel the way rock’n’roll and rockabilly did. It really touched me inside.